The trend is impossible to miss. Since early 2016, through poll after poll, voters in Newfoundland and Labrador have chosen "None of the Above" when asked what party they would vote for in an upcoming election. Support for the New Democrats has been shrinking steadily like an orange left in the sun. And the Liberals and Progressive Conservatives, the only parties actually capable of presenting an alternative government to voters in an election have been ranging consistently between 20 and 30 percent. There's no sign of that trend changing. That's because all of the parties in the province are roughly the same in the way they approach politics. They will only talk about things that are popular. Take the Liberals, for example. In October 2016, they herded a bunch of people together at The Rooms to unveil what they now call "The Way Forward." As some unnamed person from Premier Dwight Ball's office told CBC's Peter Cowan at the time, the good ideas - that is, the ones that people liked - would go into the spring budget. "The ones that go over poorly," as Cowan put it, "will be dropped. By the next summer, the Liberals had shed the plan announced in early 2016 to get the provincial government back to surplus by the early '20's, fundamentally change the way government operated, and to do away with the nonsense of the strategies for this, that, and the other thing, as the PCs used to do when they were running the place. A "strategy of strategies" Ball calls it. That phrase is right there in "The Way Forward" document. So now we have a plan of plans, instead. Inside "The Way Forward" is a plan to double the size of the agriculture industry and another one to double the size of the oil and gas industry. 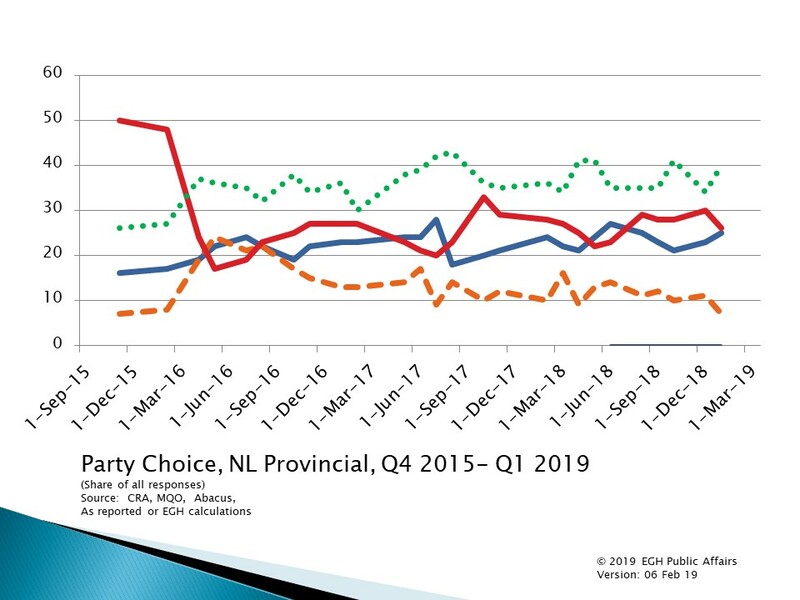 Never mind that in 2016, the same people who want to double the oil industry told us they wanted to "diversify" the economy and reduce dependence in the provincial government on oil revenues. Nope. In fact, not only is the role of oil and gas bigger than before, the current crowd running the place want to make an oil and gas company to go with Nalcor-by-another-name doing just electricity. The way to make less Nalcor will be to make twice as much Nalcor. And so the hydra grows. But rest assured all these ideas are tested to make sure they are popular, or at least not unpopular. In that respect, the crowd running the place now are like the bunch before them. They like their consultations. Except rather than the dog and pony shows with each person or interest group coming out to state a prepared position like in the strategy days, the plan-mongers now organise things differently. Only a handful of people show up: there about 25 at the last one, held in Mount Pearl. After a short recitation of the same canned speech delivered by a cabinet minister at the start of every session, people sit around tables in little groups while someone from the government asks questions and jots down people's responses. Then they take those answers and look at all the ones from every focus group... err, consultation... to see what ideas are popular with the punters and which ones are junk. Make no mistake, this is all a load of crap as far as the serious decisions of budget-making go. Long before anyone from government ever sets foot in a "consultation" the folks in government have already made the key decisions. What's left is small potatoes, at best. Sensitive to the criticism them the whole affair is a charade, the ministers this year told everyone how vital these "consultations" were. Why last year, they proudly say, we got the idea for a tax break for first responders from one of these sessions. Nice little gesture, to be sure, but not really something that would make a huge difference in a province where - to be blunt - the government is still pretty close to a 1933-style crisis. And what of the stuff designed to fix *that* pesky little inconvenience? Well, the sort of changes to the maze of public sector union contracts that drive the biggest costs in government proved to be very unpopular. So they went bye-bye the summer of 2017, having only been announced in the spring of 2016. They won't be back either, at least not until the next financial crisis. That last financial crisis in 2015, by the way, came as a result of an administration that, from 2003 onward, wanted to be popular. People like it when government spends money, so when government had money, they spent it. And when they didn't have as much money, starting in 2009, they kept spending anyway. In 2013, when another crisis loomed, they not only kept spending but they doubled down with Muskrat Falls. That crowd aren't running things any more. They have a new bunch of faces. They want to get back in government so they are talking about things that are popular, mostly with people who liked them before. So Ches Crosbie wants to cut taxes. And build a moose fence. It will be a beautiful fence, undoubtedly. But will the moose pay for it, you ask. Well, no but Ches has been very big on that old chestnut from governments past, namely getting Ottawa to pay for everything. Fight with Ottawa is Ches' answer for everything. Curiously enough getting Ottawa to pay for everything what Dwight Ball has been trying to do, so far without success. So the PCs pounce on that and point out the great success one of their recent leaders had in a fight about money with Ottawa in 2004. Keith Hutchings didn't tell the truth about that in a recent letter to the newspapers. No. Keith fibbed. That's what you do when the truth would not be as popular as a lie. Like telling people all their problems are easy to solve by fighting with Ottawa or building a moose fence or doubling oil production by doing more in a mere 10 years than anyone managed to do in the previous 30. Cynicism is easy to come by in politics. The serious political watcher will ask a simple question: will all of this sunshine and bunnies and relentless beige-ness work? Will it succeed? Well yes, if by succeed you mean getting people elected. Someone will get elected, in some combination, that might allow the crowd currently running the place to keep on running the place. Then again, there might be a different crowd if not right away, then after a few months or so. It's hard to predict the future when everything is so relentlessly beige.